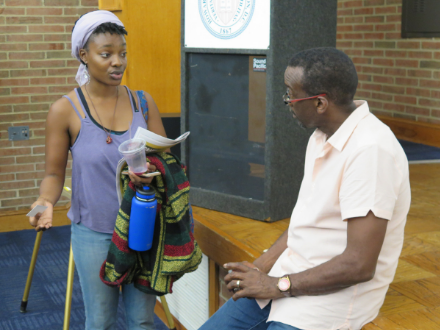 Marginalized audiences have important stories to tell, and their presence can contribute significantly to scientific understanding, documentary filmmaker Llewellyn Smith said during a Nov. 1 lecture at Howard University. He noted the historic lack of African American subjects in asthma research studies even though black communities have a higher incidence of the disease than the general population. Throughout history, he said, the contributions marginalized communities make to understanding and promoting scientific advancements have been neglected. He cited several examples during his AAAS Kavli Science Journalism Award lecture at Howard, the second in a trio of AAAS Kavli lectures this fall. He showed a film clip from “Poisoned Water,” a 2017 documentary for NOVA, the PBS science series, for which he and co-producer Kelly Thomson won the AAAS Kavli Gold Award for in-depth video last year. The film looked at the crisis in Flint, Michigan when elevated levels of lead in drinking water put the community’s children in danger. Smith and Thomson’s film described not only the science behind the rise in lead levels but also the failure of governmental science agencies to rectify the situation before more harm was done. Though some Flint officials initially insisted there was no problem with levels of lead in the water, independent findings raised public awareness and spurred attempts to hold those responsible accountable. Community activism by people like LeeAnne Walters, who determined there was no corrosion control plan keeping the interior of the pipes safe, is an example of including marginalized perspectives in science reporting , Smith said. “It’s an example of ordinary people getting into the science of protecting themselves,” he said. He Flint had suffered a history of institutional racism, which may give insight into why the issue was able to persist for so long. Smith said finding engaging characters, such as Walters, and letting them guide the storytelling is an effective way of making the story and the issues hit home. In 2007, Smith won his first AAAS award for “Forgotten Genius,” a compelling and complex character study about leading African American chemist Percy Julian. With a clip from the film, Smith showed how Julian navigated life as a black man and scientist. Attempts to bomb the black scientist’s home affected Julian so deeply that he became an advocate for equal and fair housing. Smith said it was important to show both Julian’s accomplishments and the hardships in his life to paint a full picture of his lived experience. 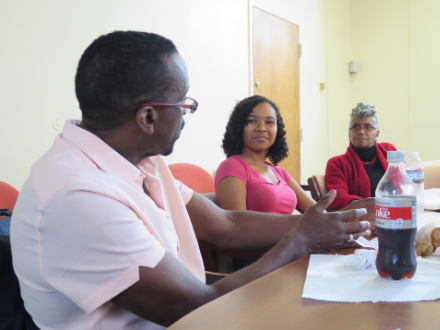 Prior to his lecture, Smith met with Howard University film students for a lunch and discussion on such lessons in filmmaking. Students described their film projects, which aim to document contemporary issues in race. Smith offered suggestions to consider when developing a story, including the importance of contextual historical research to deepen the story and add complexity. Lifelong stress related to racism, for example, may have psychological effects on minorities, Smith said, and filmmakers can use science to discuss those injustices. Smith asks uncomfortable questions in order to paint a comprehensive picture of a situation. When it comes to representation in scientific research, he said, there has been a lingering misconception that African Americans do not trust researchers and are not interested in clinical trials. In reality, he said, there is interest and researchers themselves may be biased in not trying hard enough to find more diverse populations for clinical trial studies. Such research may be skewed from consistent lack of attempts to include women and minorities, Smith said, for the sake of replicating results involving a more limited population involving largely white men. He said this begs the question of how scientists can intervene and scrutinize their own assumptions to produce better results. In a segment from the series, “Unnatural Causes: Is Inequality Making Us Sick?” ─ for which he was co-executive producer ─ Smith explored why it is unnatural and a reflection social injustice that epidemiologists can narrow down risks for disease and tell how long residents will live using only their zip code. Researchers were shown studying the high rates of infant mortality and premature births among African American mothers. They asked whether genetic factors play a role in the premature births — regardless of the mothers' education, health care and lifestyle — and decided they don't. Newborns among U.S.-born white mothers, African American mothers and African immigrant mothers new to the U.S. were compared. It turned out African-born women living in the U.S. and white U.S. born women had similar pregnancy outcomes, compared to African American women whose babies tended to weigh less. But studies suggest it only takes one generation after African-born women immigrate to the U.S. for their daughters to show higher risk for premature births. Findings like this allow researchers to consider how racism and trauma may contribute to emotional and physical health risks, Smith said. Smith is currently working on a documentary about how Cuban immunological research has produced an effective drug for stage 3 and stage 4 lung cancer. The film will explore how Cuba is becoming a national leader in immunotherapy and historic collaborations between Cuban and American cancer researchers. The AAAS Kavli lecture series brings winners of the award to campuses for public talks and classroom workshops. This is the second year for the fall lecture series. In 2017, the lecturers were Carl Zimmer, Richard Harris and Paula Apsell. This year, three-time award winner Sarah Holt lectured on addiction at Arizona State University’s Walter Cronkite School of Journalism and Mass Communication on Oct. 22. Two-time award winner Hillary Rosner lectured about reporting on nature and conservation at the Medill School of Journalism at Northwestern University on Nov. 8.